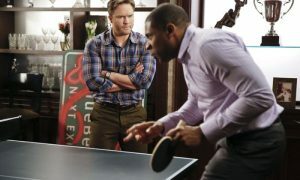 HART OF DIXIE Episode 3.20 Photos Together Again : FIX IT — While Wade (Wilson Bethel) is upset with Zoe (Rachel Bilson) over his relationship issues, she decides to lay low and help George (Scott Porter) out with his problems with Lemon (Jaime King). Meanwhile Lemon and Wade decide to play hooky from their respective problems. AnnaBeth (Kaitlyn Black) is excited to introduce her new boyfriend to her parents, until they decide they would rather spend time with Lavon (Cress Williams). Brick (Tim Matheson) tries to help Wanda (guest star Mallory Moye) and Tom (guest star Ross Philips) cope with infertility issues. Michael Schutlz directed the episode written by Sheila Lawrence and Dan Steele (#320).